It had been eight long months since my last trek (Torna) and my feet were itching to once again head towards the Sahyadris ! . Months had passed with me making and canceling plans for some or the other trek. Soon , the month of March arrived , practically the last month before the heat and sun of the summers made trekking a boring and tiring affair ! . A trek had to be done now , or I would have to wait out the summers ! I chanced upon a new trekking group ‘TREK MATES’ on orkut , saw that they were going to Alang and Madan a couple of days later and decided to join them . A couple of calls and I was in ! .It took me all of fifteen minutes to find out , ask my parents and register myself !! 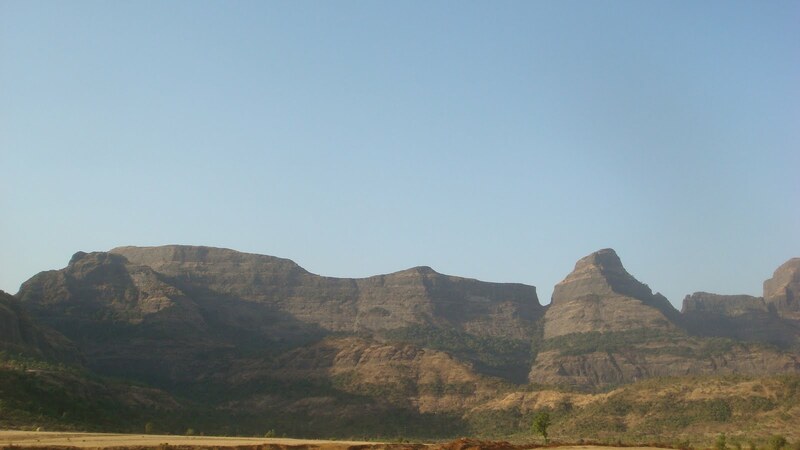 Alang and Madangad are located in the Igatpuri region, north of Mumbai just before Nashik. These two, along with a third, Kulang, form a celebrated mountain range. These three hill forts provide some of the toughest and longest climbs in the Sahyadri mountains and are something of a pilgrimage for trekkers ! So there I was , raring to go for the trek . I was to catch the VT – Kasara local , which I did at Kurla , alongwith another guy who had joined from Panvel . Me and Devkiran got into the second last car , just as it had been mentioned in community page . ” Call up Shashikant ,” I said ” He was supposed to get in Dadar itself ” . Devkiran , after trying a couple of times , managed to get a call through . Apparently they , Shashi and a couple of others were in another bogey . Next station , I and Devkiran got down and quickly scampered across . We met Shashikant , Sonali and Samyukta and time passed uneventfully till Kalwa . Nilesh , Priti , Prasad and some others were to join us at Kalwa . ” They got into the second last car ” said Shashi , as we passed Kalwa . I again ran back ,alongwith the others , to the second last bogey when the train stopped at the next station !!! . A few others joined us at Kalyan and the group was almost complete . Almost except one guy , Vikram Singh , who had decided to take a bus to Kalyan from Panvel . He got stuck in traffic jams , missed the train and finally hitch hiked his way to Kasara ! . In the train though , the crowd got progressively lesser as we passed Kalyan . For the last leg of the journey , it was just us in the whole compartment . I stretched myself out on the seats , wandered around , chatted with my new friends , stood for sometime at the door enjoying the breeze ! Fooling around in an empty local is an experience in itself ! Dozens of blue coloured handles swung rhythmically from the roof , seeming almost surreal without anyone holding onto them for support ! . We finally reached Kasara at around 3 am on the 7th . For reaching Ambevadi , the base village , Nilesh had already arranged for a couple of jeeps . After a quick introduction round , we were off ! . I found myself sitting on the overhang of the bloody vehicle . With the guy driving like Schumacher , it was one thrilling experience . I felt like I was sitting on a springboard ! . So there we were , bouncing along potholed roads for a good two hours before Ambevadi came into sight . Here the potholes came to an end (and so did the road ) . There wasnt any proper road leading to the village , just crushed yellow stones marking the way . Was primarily meant for bullock carts i guess . We finally reached the village at day break . I quickly clambered out , glad that I wasnt feeling like a jackhammer ‘ any more ! . After a quick tea and breakfast at a kind villager’s house , we set off for our trek . Accompanying us were Dyanesh and another guy whose name I forgot , our guides . A few minutes of walking and the full range of Kalsubai came into view . Well , words cant describe the huge mountains lording over the tiny village and us . To the far left was Kalsubai , right in front of us was the huge wall of Alang , like a massive wave of basalt , stopped dead in its tracks . Further out were Madan and the square massif of Kulang . I was totally awed . Torna was big , but this was scary ! Our trek started on a long , low lying spur jutting out of Alang . Like any other hillock , it was covered in deciduous forests , so common throughout Maharashtra. Dried leaves scrunched under our feet as we made our way ahead . Sometimes the path would rise ,and at other times stay flat . The branches of the trees created just enough shade to make the hike a pleasant one ! . After about a couple of hours of trekking , we came to a rock patch . This was the simplest one on the entire fort ! . A gentle gradient , with enough footholds to help us along . Of course , falling would still have been disastrous , but at least the climbing was pretty easy ! . We came to a small cave , where we dumped our bags and had some snacks . ” theplas anyone ” someone asked . I stretched my hand out for a couple . People were fooling around , cracking jokes , taking snaps .. and getting ready for the long traverse to Madan gad . We stepped out of the cave and turned left . With the mountain on one side and the valley on the other , we starting trekking our way to Madan .At one point on the traverse , we came across a very exposed patch . The entire traverse is exposed actually , but this was particulary narrow , and sloping straight into the valley . It was a bit tricky , but everyone was managing it without any hassles . One , two , three , four , five .. then all of a sudden , Shashi , who was right in front of me , tripped and slipped towards the valley . My heart skipped a beat , as Shashi fell , hands flailing . Then , just in the nick of time , Nilesh , who had been standing there to guide people across , grabbed Shashi’s wrist . I heaved a sigh of relief . A few seconds here or there , and it would have been a very different story . I can vouch for that .. I had a ringside view of the action . But the trek had to go on , we had a couple of mountains to conquer ! The exposed traverse of Madan gad ! The traverse continued , finally ending with broken steps which led upward . The steps ended into a dead wall ! This was the famed rock patch of Madan . A thirty foot wall overlooking a three thousand foot valley ! Dyaneshwar climbed first , then Prasad followed . I am amazed really , how people free climb in such places ! . Then Nilesh and Priti climbed up and secured themselves to pitons already in place . Then the rest of started climbing . For one guy climbing , there were fifteen others advising him , making suggestions , guiding him along , cracking jokes , passing comments and generally creating a lot of noise ! . ‘ Move to your right ‘ .. good .. now left … get the toe hold properly .. can u see that piton ? .. yeah that one .. move further up .. one more piton .. good .. excellent .. just a little more .. great . With able guidance from Nilesh and Priti and the rope .. I had made it past the patch ! More stairs , covered with scree led towards the top . I came across a darwaja , now almost completely in ruins . Further up , the top of the mountain . It was mid afternoon by now and we were thirsty like hell ! . Madan dissapointed us though , hardly any water in any of its tanks . We painstakingly managed to fill a couple of bottles . Before long , I was at the summit , taking in one of the most breathtaking views I have ever seen . The view you get from the top of a mountain , you can get only from the top of a mountain . Books , photos , videos etc cant even begin to give you an idea . The summit of Madan is queer .. with huge red boulders stacked up like a giant rock sculpture ! . From here , we could see the great arc of Alang , like a huge ‘C’ . Slightlyfurther out , Kalsubai , alongwith a tiny saffron speck atop it , marking out the temple . And of course , to my right was the huge fort of Kulang , with its vertical faces . In the distance , I could see Ratangad , Khutta Sulka as also Katrabai . A most exhilarating experience ! . Sightseeing done , we turned back for the descent . Descending was relatively simpler , by rappeling . It was my first rappel and I thoroughly enjoyed the experience . Part of the group had already progressed ahead to Alang , leaving us six to bring up the rear . Again the traverse , this time in the evening ! . We passed the cave , and I was pleasantly surprised to find that my sack had already found its way up Alang . We came to the first rock patch of Alang , right outside the cave , to the right . Remnants of a staircase could be seen here . It was nearly vertical , but with a good number of hand and footholds . I would say it was about fifteen feet high , with a steel cable attached to it for support . Dusk fell as we made our way up , then further up by a flight of stairs . The stairs , once again ended into a wall . The British had done an even cleaner job of blowing up stairs on Alang . There wasnt a hold or grip in sight ! . The sun set soon after that , plunging the entire region into darkness . Climbing was out of question , everyone would have to be hauled up . Dyaneshwar dangled down a rope . Nilesh climbed first , then Vikram , then it was my turn . With the rope tied to my waist , and a couple of guys atop preventing me from slipping in the opposite direction ; I started climbing . At first , I thought getting past the sixty foot patch would be a herculean task , but I think I managed pretty well . The trick was to get into a position like you would for a rappell , kind of reverse rapelling . A single torch light lit up the rope and I moved upwards inch by inch . Climbing that patch on Alang , in absolute darkness , with nothing but a small torch to guide me .. it is one experience I will not forget in a long long time ! . After the patch , a small cave then another flight of stairs . These stairs were huge ! Each one reaching up above my waist ! Every step , thankfully had a handhold , by which climbing was far easier . I had my cellphone torch with me , which gave just about enough light to help me see a couple of steps ahead . The strong black stairs stood out in the torchlight , sandwiched between the inky blue of the sky above and the black nothingness of the valley below . We soon came to a tricky patch , a slightly exposed one , but my great friends were as always present to help ! Finally , the plateau of Alang . In the distance I could see a couple of torchlights . My buddies are already in the cave , I thought . Then another light appeared , a bigger brighter orange light . Someone had lit a bonfire inside the cave . Now why would anyone do that ? Beats me ! One by one , we made our way to the cave . The fire had been put out , only to be replaced by thick grey smoke ! . We had our dinner outside , as we waited for the smoke to clear . I looked out towards Madan , and Kulang , now silhouted against the dark skies .In the distance , I could see the lights of Igatpuri , a fast growing town . Nobody spoke much at dinner time , tired after a day of hard trekking . Everyone mostly kept to himself or herself , quietly eating and filling a hungry stomach . Apart from a spurt of excitement , when Chaitanya spotted a viper , and everyone ran towards the snake , instead of running away from it , it was mostly a calm and quite night . We retired into the caves to sleep , and before long I was fast asleep on the hard ground ! . Daybreak brought with it a new freshness to the air . The cool morning air , with the breeze flowing gently , made it perfect for the summit climb . Some of the guys had already made it to the top , me by virtue of getting up an hour later than them , lagged behind . Thankfully , there were a couple of other lazy bones with me , so it didnt matter much . Crude steps here and there marked the way to the top . Before long we had reached the uppermost plateau . Remnants of fortifications lay strewn all over the place . Further ahead , huge water tanks of stone . Amazingly , they still had plenty of water even in March ! . Finally , after walking on the plateau for about half an hour , we reached the summit . The view from here was even more amazing than Madangad . Alang stretched out on either side , like two huge arms .We could see Madan , Kulang , Kalsubai as also Harishchandragad and theMalshej ghat region , albeit hazily in the far distance . After wandering around for some time , we started back for the caves . We were just in time for tea and breakfast . Breakfast was of course the all time favourite maggi . ! I had brought a bowl with me for tea and maggi both . I first had maggi in it , then the tea ! Thts what you call masala chai I guess ! . Breakfast done , it was time to descend . Before long , I found myself doing the second rappel of my life . Rappelling down the patch was far easier than climbing up ! . Keyur infact did a commando style rappel , with his back to the wall ( pun unintended ! ) . Everyone , now fresh after a good nights sleep , was having a good time at the rock patch . Garudi ( Prathamesh ) busied himself with throwing khajur seeds at us , who had rappelled down . Well , when it was his turn to get down , he got plenty of whacks before his feet touched the ground ! . Me , Shashi , Sonali , and some NRI from Madrid ( forgot his name .. sorry who ever tht was ) started descending ahead of the others . The scree and rock patches made the descent more than thrilling . But at the same time , it was far less time consuming . Though we were in front , Shashi and Samyukta took a wrong turn about ten minutes from the base and generally got everyone involved for 20 – 25 minutes in a really unnecessary problem . Parag had followed them into that wrong turn , so now we had three people roaming around on the mountain. We cried ourselves hoarse shouting ‘Shashi’ and ‘Samyukta’ , ‘Parag’ and thankfully they quickly found their way to the village . We took an ST then to Igatpuri . Time was merrily spent in singing popular songs and cracking jokes and time simply flew past . I didnt even realise when we entered Igatpuri ! . From Igatpuri , by jeep to Kasara . Then the long journey by local to Thane . I had a new friend in Vikram Singh , so I had company right upto Vashi . An exhilarating and trek had finally come to an end . Excellent planning and management by Nilesh , Priti , Vikram and Prasad and a great group of trekkers had ensured a memorable day !! Previous Previous post: Do current India see themselves as the successor to the Mughal empire (Muslim) or Maratha empire (Hindu)?